By Dan Ambrose: Adrien ‘The Problem’ Broner took to social media on Wednesday to expose – and turned down – Matchroom Boxing USA promoter Eddie Hearn’s 3-fight $6.75 million offer, which he refers to as ”slave deal.” Broner, 28, says Hearn’s deal offered to him is worse than the deal offered to him by Roc Nation. Broner is showing his youth by positing Hearn’s offer to him on social media. That’s a tad bit unprofessional on his part if he wants to stay in good with him and other promoters. Hearn’s deal is twice what Broner is making now with his $1 million per fight. 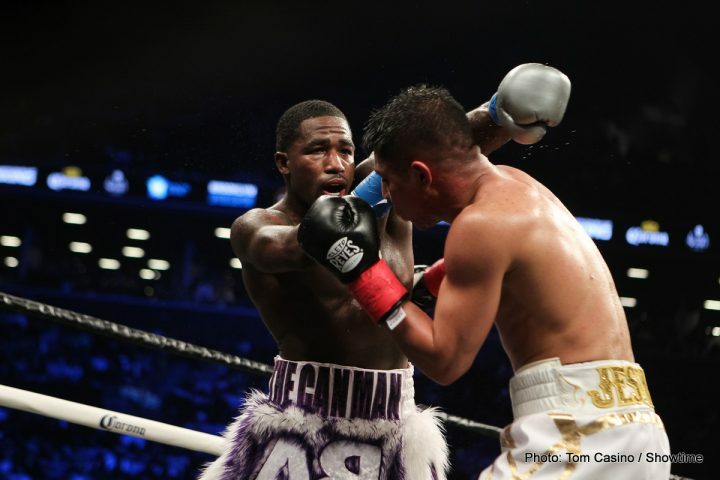 Broner made $1.5 million for his fight against Mikey Garcia, and $1 million for his last fight against Jessie Vargas. It’s unclear what he’s looking for from the British promoter. Broner hasn’t been a world champion since 2016, and it’s unlikely that he’ll be able to win another world title at this point in his career unless he can drain down to lightweight or super featherweight and try and use his size to beat one of the champions. I think it’s too late for Broner to go back down to those weight classes because he’s simply too big at this point. What could be hurting Hearn in signing Broner is the $1 billion announcement that he made. That wasn’t the smartest thing for Hearn, because now the top fighters are going to ask for more than what they’re worth. When they don’t get what they’re asking for from Hearn, they’re going to be unhappy, as Broner is showing right now. He’s obviously expecting a lot more than $2 million per fight. Who knows how much Broner wants per fight, but I wouldn’t be surprised if it’s in the $5 million to $10 million range, which would be absolutely ridiculous for a non-champion to be getting. Hearn shouldn’t have broadcasted the news of hi $1 billion deal with DAZN, because now the fighters want huge money to with him. They don’t realize that Hearn can’t afford to overpay because his money will quickly evaporate before he’s gotten past year 4 of his 8-year deal. Hearn wants to keep Broner (33-3-1, 24 KOs) wants to keep Broner busy by having him fight three times a year, which is the right way to keep his name brand going strong. But obviously is not pleasing Broner, who is likely looking for a big signing bonus. If Hearn sweetened the deal by offering Broner $40 million for a signing bonus and then offered him those purses, he might be a little more receptive to a 1-year deal. Hearn is trying to sign a bunch of superstars to his DAZN platform after having made a huge 8-year, $1 billion deal with the streaming company. Hearn needs to sign a lot of fighters in a big hurry for him to be able to start the subscription service in September in the U.S and in the UK. Hearn has 16 dates for the U.S and 16 for the UK that he needs to fill with top fighters. Hearn can handle the UK side without any problems, as he some of the fighters over there. But in the U.S, the only guys that Hearn has are Daniel Jacobs, Julio Cesar Chavez Jr. and Gabriel Rosado. Hearn might not even have Jacobs, because he’s signed with HBO Boxing. It makes Broner look bad in exposing the deal that Hearn has given him. I don’t think that was a good idea for Broner to make that move, because he might not get another offer. Trying to embarrass Hearn isn’t the way to negotiate with him. Broner should have just told him that it’s not enough money for him to accept it. Hearn then could have made some adjustments and perhaps came back with a bigger offer. But with the way Broner posted his offer on social media, I doubt that Hearn will give him another offer unless he’s desperate, which I think he is. ”I’m sorry Eddie Hearn, you a good guy and all, but you tried to give me a worst deal than Roc Nation offered me. The sh-t is ova #SlaveDeal,” Broner said on his Instagram. You can understand where Hearn is coming from with his offer of $6.75 million to Broner for 3 fights. Broner is looking like a washed-up fighter at this point. He can’t beat the top welterweight, that’s been established already. Broner lost to lightweight Mikey Garcia last year after he moved up to 140 and fought him. If Broner fights the best fighters at 140, like Regis Prograis, Viktor Postol, Josh Taylor, Jose Ramirez, Kiryl Relikh and Sergey Lipinets, he’ll likely lost to them badly. Broner’s record in his last 6 fights is 3-2-1. That’s not the kind of record is worthy of the money that Hearn is offering him. It doesn’t make sense for Broner to be rejecting an offer of over $2 million per fight. Let’s face it; Broner is one fight away from being finished as a world class fighter. Hearn likely would be asking Broner to fight good opposition in all three of those fights, and it wouldn’t be surprising if he loses all of them. It would be game over for Broner, because Hearn wouldn’t waste time re-signing Broner if he loses all three of his fights with him, and neither would any of the other promoters. They would perhaps sign Broner for his trash talking ability, but it would be at a cheap price that doesn’t cost them much. It doesn’t make sense for promoters to sign journeyman at top dollar, and that’s what Broner is turning into.